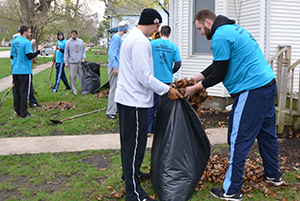 Upper Iowa University students, faculty and staff will be joined by other local volunteers in conducting unique service projects in five Fayette County communities during the 11th Annual Fayette Appreciation Day on Wednesday, April 19. Since being established over a decade ago, over 4,500 UIU volunteers have completed more than 400 service projects during Fayette Appreciation Day. The event has been recognized locally and nationally, receiving awards from the State of Iowa Governor’s Service Awards and President’s Higher Education Community Service Honor Roll.